Renfrew metal sculptor Jack Stekelenburg enjoys challenging our preconceptions of art. Following in the footsteps of his philosophical and artistic mentors, he creates art as an unconscious, unscripted, wordless act of emotional expression. He also plays and experiments and grows as an artist. His sculptures are thought-provoking, powerful, fun, confusing, whimsical, disturbing. Most are not representational, familiar or comfortable. Neither is the art of his adopted “mentors” — Dali, Picasso, and the American abstract expressionists of the 20th century. Stekelenburg is the first person I have met who has spontaneously described the thrill he experienced when he first saw the National Gallery of Canada’s controversial 1989 acquisition, Barnett Newman’s huge colour field work, “Voice of Fire”. The name of Stekelenburg’s studio — Walden Three — proclaims the profound influence that the transcendentalists of the 19th century have had on him. Ralph Waldo Emerson and Henry David Thoreau posthumously inspired a young construction worker from Renfrew to become self-reliant and celebrate the fact that his high school peers judged him as “different.” For one thing, Jack read Emerson and Thoreau. For another, he loved photography and abstract art. And although he was strong, he wasn’t a jock. The abstract expressionists were certainly misunderstood. The biographies of those who persevered and changed the face and definition of art are replete with stories of personal hardships and reports of vicious criticism. It was only in 2005 that Stekelenburg decided to indulge his passion for art, which he had put on the back burner while he started a career in construction and raised a family. 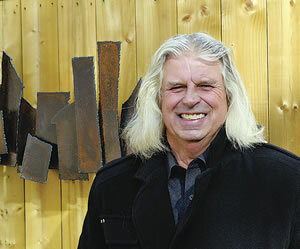 Intrigued by metal garden art, in 2005 he signed up for a course in welding. He started experimenting with discarded pieces of metal, sometimes inspired by the shapes he found, and sometimes molding heavy, cantankerous hunks of metal into abstract forms that evolved as he worked on them. He soon discovered that, in addition to the protective gear he needed as a MIG welder, he also needed a thick skin. When he first decided to forego the instant gratification and financial success of creating popular sculptures like Great Blue Herons, and instead began constructing truly abstract works, he was able to cheerfully endure the good-natured taunts of friends about his “boat anchors”. In some cases, he found more encouraging friends, particularly at the Renfrew Art Guild. His conviction and determination are paying off. His abstract sculptures are attracting attention in galleries and studio tours, and people are putting their money where they let their hearts and imaginations take them. That is the lure of the abstract — the viewer has free rein to interpret and project. Stekelenburg’s “Rock the Cradle” (above) is a prime example. In 2003, a lecture and an IMAX movie convinced Stekelenburg that he wanted to go to Nepal. He informed family and friends that he was going to go in 2008. He did. In preparation, he started planning and saving money. 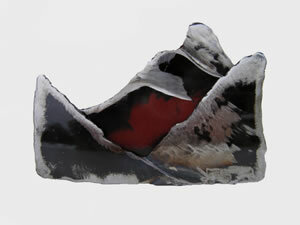 After his welding course he created a series of inspirational mountain sculptures. He reassessed his life. His trip to the Mount Everest Base Camp proved monumental in many ways. His dedication to art was reinforced. He has repurposed his life. Now he is at work on a performance/installation art sculpture project that he hopes to realize in 2013. Art critic Harold Rosenberg wrote about the Abstract Expressionist period that “At a certain moment the canvas began to appear to one American painter after another as an arena in which to act. What was to go on the canvas was not a picture but an event.” Canadian metal sculptor Jack Stekelenburg is creating a sculpture event. It involves the elements: wood, metal, fire and, of course, the weather. Watch for it in theHumm. Stekelenburg’s gift is his unwavering determination to discover, and perhaps re-invent, himself. His life, like his art, continues to be a work in progress. Stekelenburg’s favourite role model is American abstract metal sculptor David Smith. This quote from a speech Smith gave in 1959 at Ohio University explains why: “Art is made from dreams, and visions, and things not known, and least of all from things that can be said. It comes from the inside of who you are when you face yourself. It is an inner declaration of purpose; it is a factor which determines artist identity.” Stekelenburg’s art is worthy of attention because he trusts himself. Jack’s work is also available at Brush Strokes Art Gallery in Carleton Place. To learn more about him and his powerful artistic statements, visit his Facebook page or contact him directly.